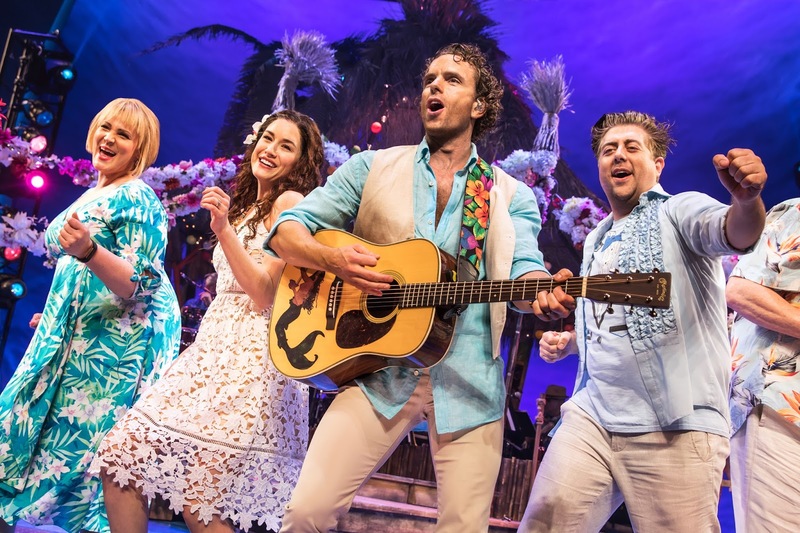 Yes, this is yet another of those jukebox musicals, this time crafted around the songs of country-rock star Jimmy Buffett, but by golly, much as I disdain the genre, I found “Escape to Margaritaville” thoroughly engaging. Book writers Greg Garcia and Mike O’Malley have done their job of shoehorning the Buffett playlist into a plausible story most skillfully. There are some new songs too in their script about an island destination in the Caribbean. Cincinnati girlfriends Rachel (Alison Luff), an overly earnest environmental scientist, and Tammy (Lisa Howard), engaged to be married to a crude fellow named Chadd (Ian Michael Stuart) who has problems with Tammy’s weight issues and her punning sense of humor, have come there for a bachelorette vacation. At the ramshackle resort hotel run by sassy lady Marley (very likable Rema Webb who has a way with a one-liner), they encounter the resident beach bum singer Tully (Paul Alexander Nolan) and bartender Brick (Eric Petersen). Rounding out the central characters there’s aging hippie and former pilot J.D. (Don Sparks) and Marley’s assistant Jamal (Andre Ward). Inevitably, of course, uptight Rachel falls for Tully, and Tammy does likewise for Chadd, though as she’s resolved to be faithful to Chadd, the latter relationship stays platonic. The Buffett songs are introduced with some ingenious cues in the script. Some are intentionally obvious for comic effect, and the audience laughs good naturedly; others are more subtle. Nolan eases into the title number very nicely, as the audience hums along. Sparks has fun with a coy, audience participation rendition of “Why Don’t We Get Drunk (and S----)?” But it all adds up to very easygoing entertainment. Buffett’s music is well served by Michael Utley’s orchestrations and Gary Adler’s dance arrangements, all expertly led by Music Director Christopher Jahnke. The ending feels a bit perfunctory, and Rachel’s eventual succumbing to Tully is rather protracted. But hey, it allows time for a few more pleasant numbers. Walt Spangler has designed a cheerfully colorful island setting, rather like “Spongebob Squarepants” in its bright color palette, and Paul Tazewell’s costumes are likewise festive and bright with Howell Binkley’s lighting adding to the upbeat ambience. As in “Spongebob,” incidentally, a volcano serves a major plot point, and there’s a number where a character declares he always wanted to be in a big tap number. In this case, it’s Petersen who gets to strut his stuff. There are two instances of neat aerial stunts which add to the fun. The cast sings beautifully and they’re all extremely likable. Nolan has a great voice coupled with lots of charm and charisma. Howard follows up her scene-stealing “It Shoulda Been You” role with another impressive outing. Petersen is lovable and you root for him and Tammy to click which, of course, they do. Luff is a lovely heroine in the Laura Osnes mode, even when her character is bit of a pill. Vocally, everyone is top-notch. Christopher Ashley directs the proceedings with the requisite light touch, and Kelly Devine has provided some nice dance numbers, even bizarrely involving the spirits of the deceased insurance salesmen who died during a volcanic eruption years earlier. During the finale, beach balls (lots of them) are hurled into the audience, reminiscent of the far less successful Beach Boys musical “Good Vibrations” over a decade ago. 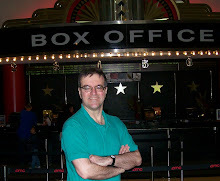 The substance of the show began to evaporate within minutes of leaving the Marquis Theatre. But I had a good time while it lasted, and I think you will, too.